Circus, music, an elephant, a mouse: the secret history told by a music box on the notes of Julius Fu?ík. 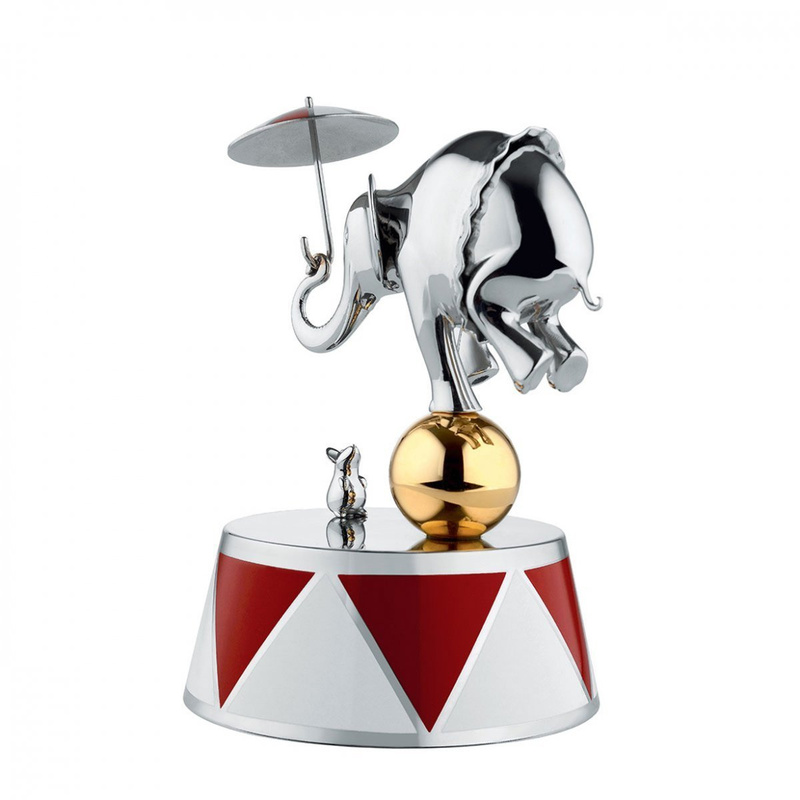 The Ballerina music box by Alessi whispers the mysterious story of how a small mouse has managed to tame a big elephant. Through the elegance of the proportions, you can see how this last animal can show lightness and unexpected talent for dance. 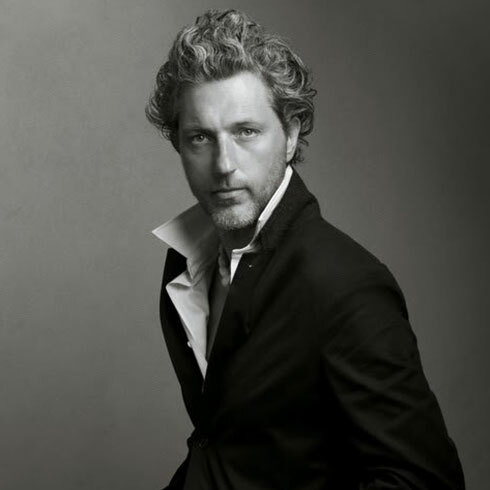 All these features create a memorable effect, thanks to the contrast between the heaviness of the materials of which it is made, and the delicacy of the music that accompanies the circling of the characters: The Entry of the Gladiators by Julius Fu?ík. The small mouse, equipped with a whip, is the great tamer and the big elephant is the graceful acrobat/dancer. 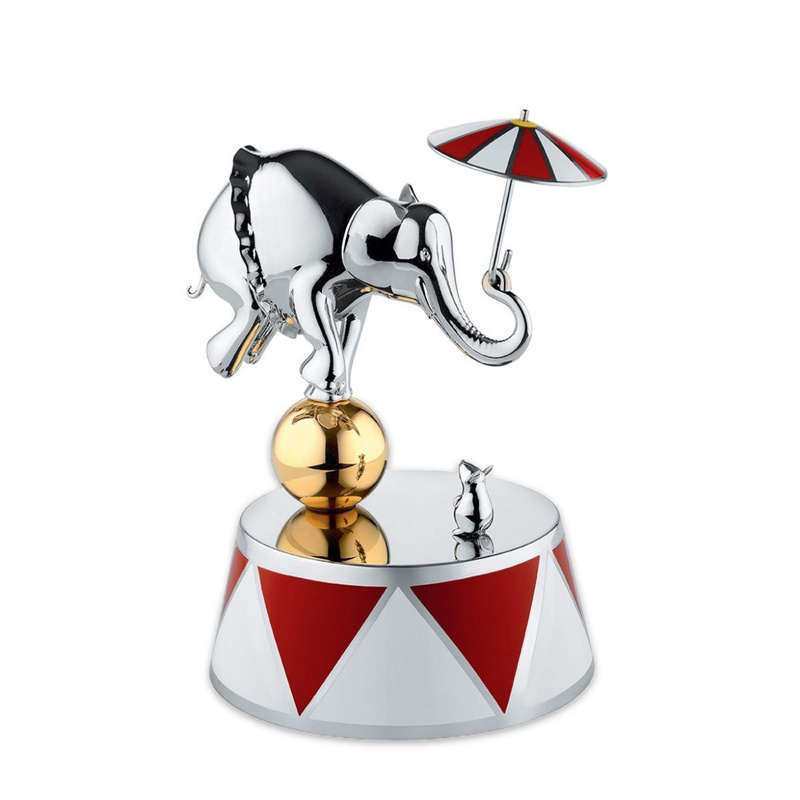 The elephant wears a tutu and is in balance on a ball while with its trunk holds an open umbrella. The music gives life and harmony to the scene, making everything perfect. 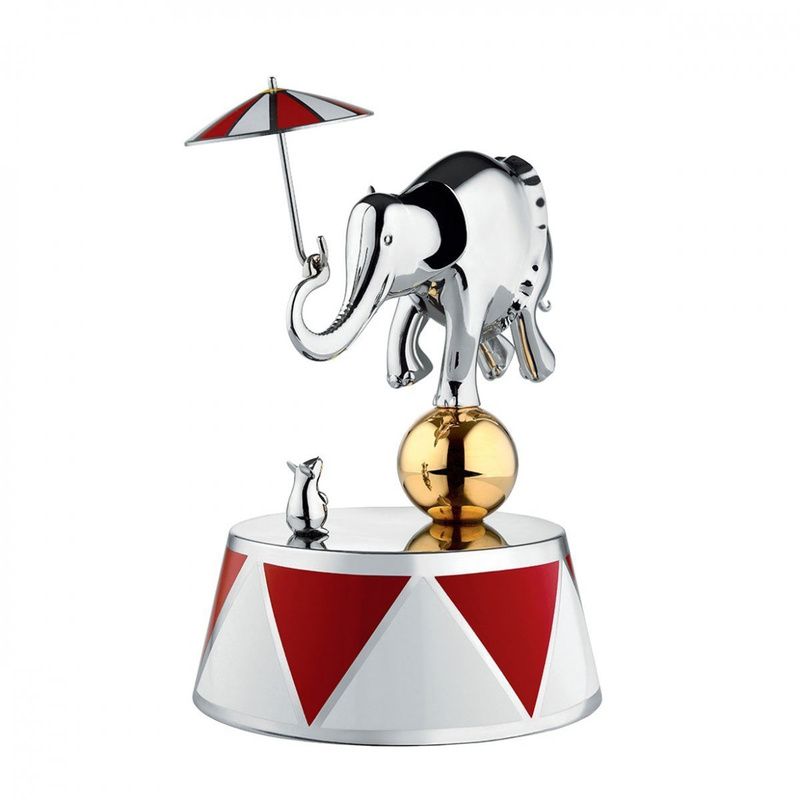 The music box is a sculptural object of design belonging to the Circus collection by Alessi, created in 2016 by the Dutch designer Marcel Wanders. 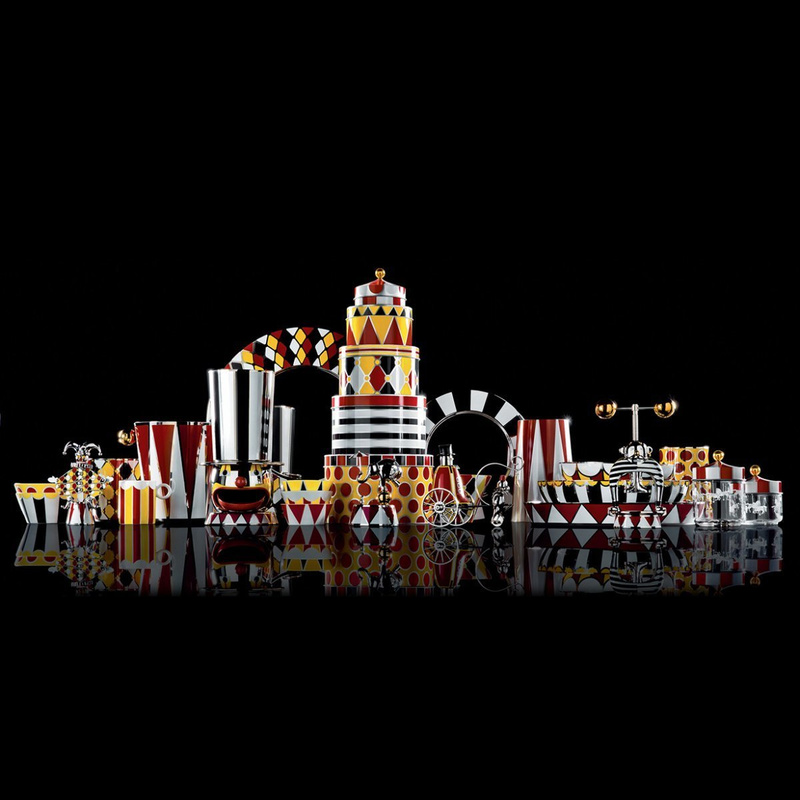 The entire line was created to evoke the magical and amazing world of the Dutch circus. This music box is part of a limited edition, which means that it has been produced in limited numbers only. In particular, there are 999 music boxes and 9 artist's proofs. This dancing sculpture is made of 18/10 stainless steel. The whole work is painted in the colour shades of red, yellow and gold, except for the main characters: the mouse and the elephant. One of the main characteristics of steel is that it reflects light: this means that during the vaults the two unusual protagonists create magical and lovely plays of light. The music box consists of 18 parts, made through four different production processes, to achieve the best result in each piece. 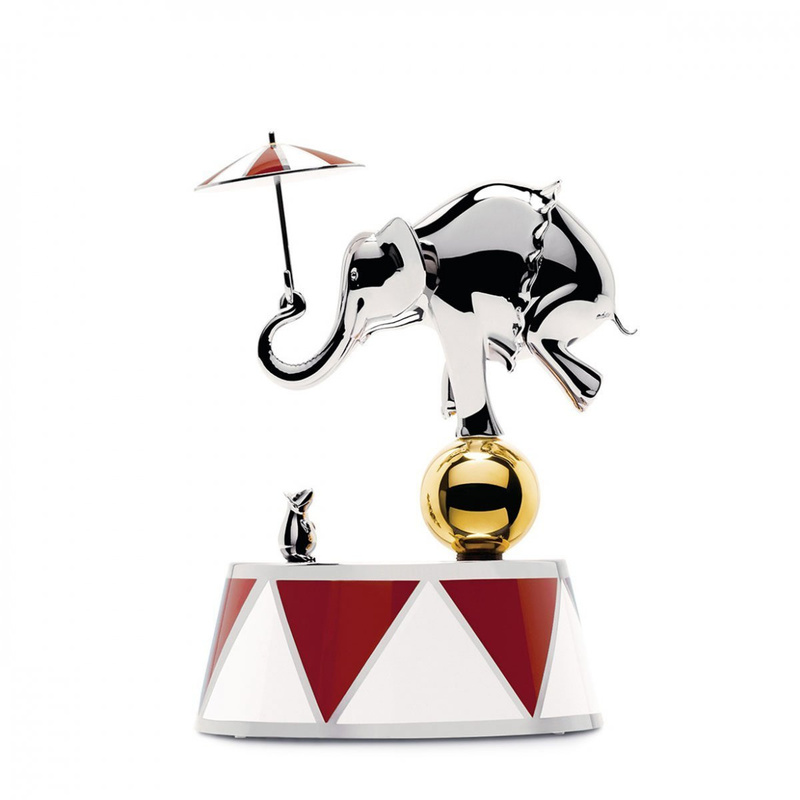 The elephant shape consists of three parts welded together using laser technology. The mechanism of the music box is handcrafted in Switzerland. The decals were applied by hand and fixed through oven-baking.